I hope you are enjoying the Xyron Blog Hop with DCWV!!! Today I created a Eclectic Travel Journal using DCWV Eclectic Chic 12 x 12 Paper Pad and fabulous Xyron products. 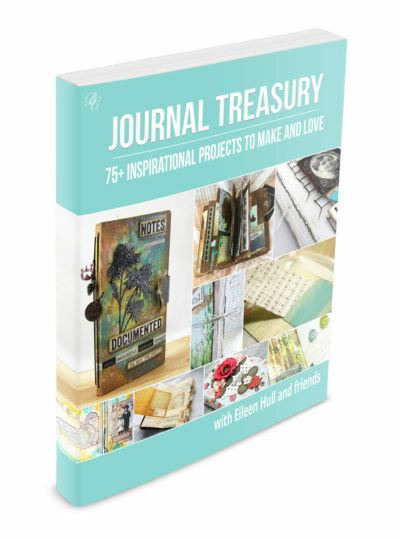 Begin by cutting the Journal Die from mat board and pattern paper. 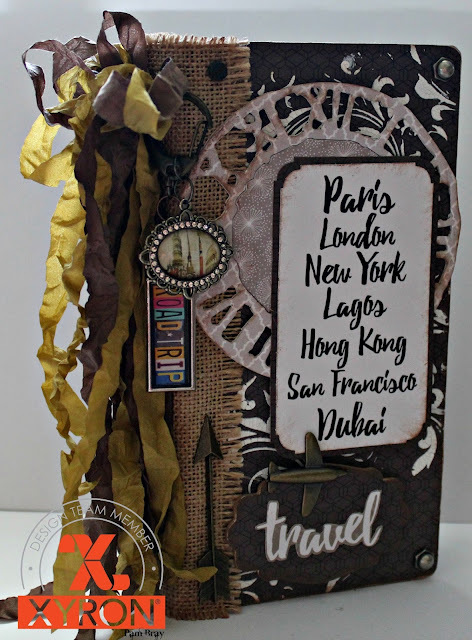 Run the pattern paper through the Xyron Creative Station using Xyron 9" Permanent Adhesive. Adhere the prepared paper to top of journal. Lay stencil on top of prepared journal cover; add paste with palette knife. Dry. Glue covers together at bind. Add burlap to binding using Xyron Mega Runner. Run pattern paper and sentiment through Xyron's Creative Station. Add prepared paper to mat board; die cut out. Ink edges of prepared clock; adhere to front of journal. Trim around adhesive sentiment; corner punch. Layer together; add to front of journal with pop dots. 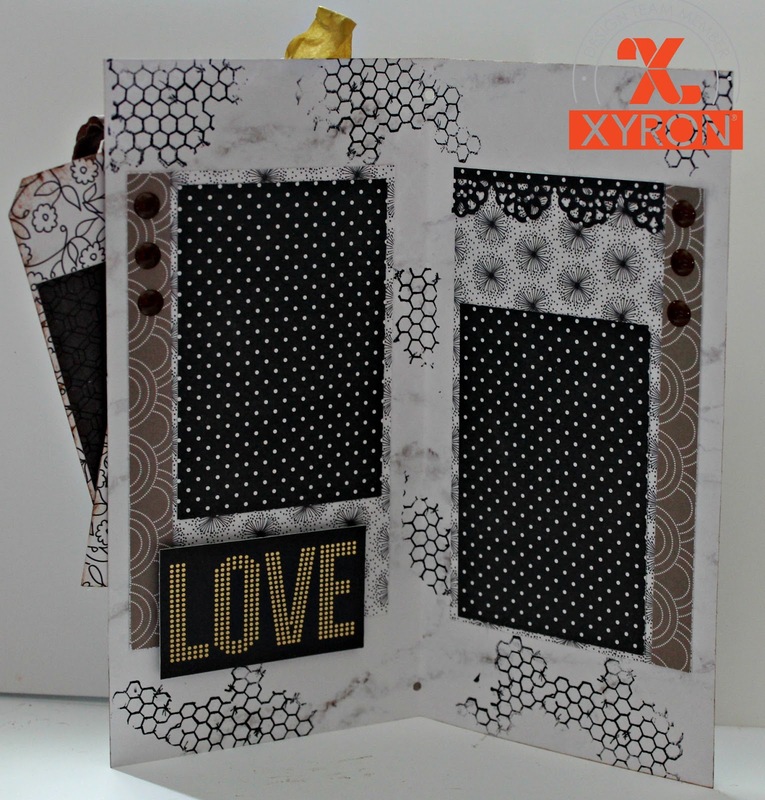 Die cut label out with mat board and pattern paper; adhere together using Xyron Creative Station. Fussy cut travel from journal block; adhere to top of label. Add metal airplane charm to front. Punch scallop from pattern paper; run through the Xyron 1.5 Sticker Maker. Add to tags and tag pocket. Decorate tags with DCWV Journal blocks and ribbon. 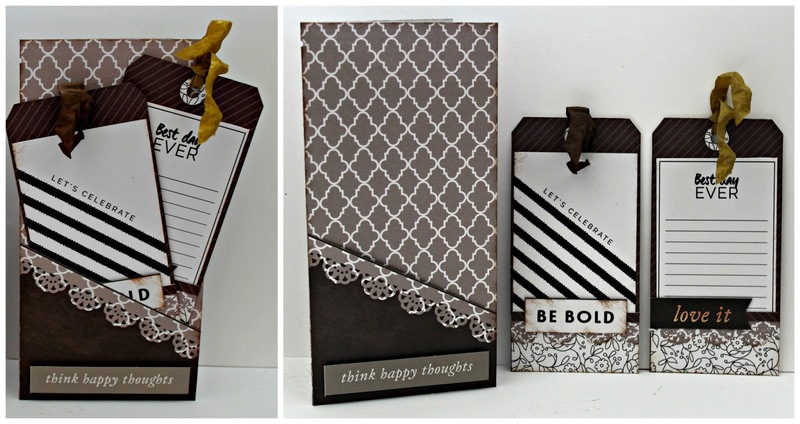 Add sentiments to front of page and tags with pop dots. Decorate inside pages with stamps, DCWV Eclectic Chic pattern paper mats, strips and sentiments. Mist wrinkle ribbon; squish up and allow to dry. Tread prepared ribbon carefully through pages. Thread ribbon through the burlap binding. Add metal charms, arrow and metal pieces to cover. 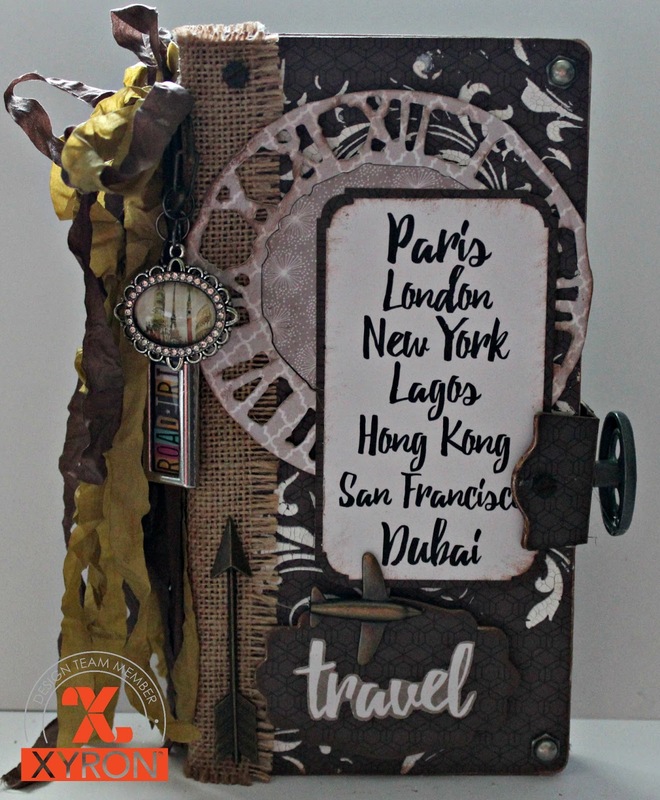 Die cut latch from mat board and DCWV Eclectic Chic pattern paper. Adhere together with Xyron Creative Station. Add handle to edge of latch. I hope you have been inspired by my Eclectic Travel Journal. Make sure to stop by the Xyron Facebook Wall to see other fabulous projects from Jessica Beekman Roe and Nicole Wright .